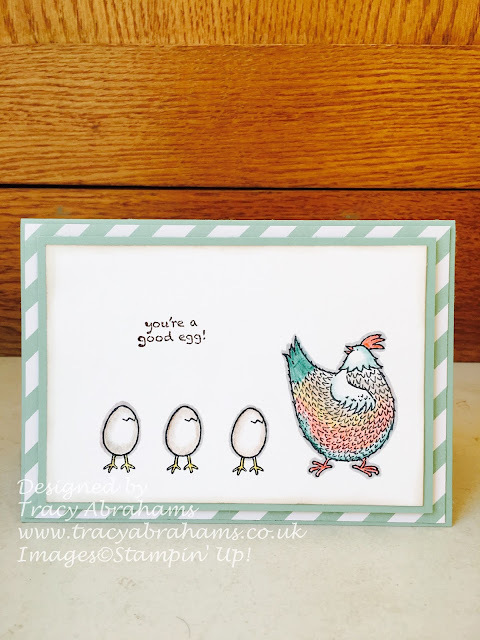 I wanted to share with you some cards I had fun making over the weekend with the Hey Chick stamp set. The set is FREE from Stampin' Up! when you place an order worth £45 or more with products from either the Annual or Seasonal Catalogues. It's such a great time of year because it's one Free item for every £45 spend and there's no limited to the items you can have as and you get to choose from 12 in the Sale-a-Bration Catalogue. They are so adorable and they were such fun to create. 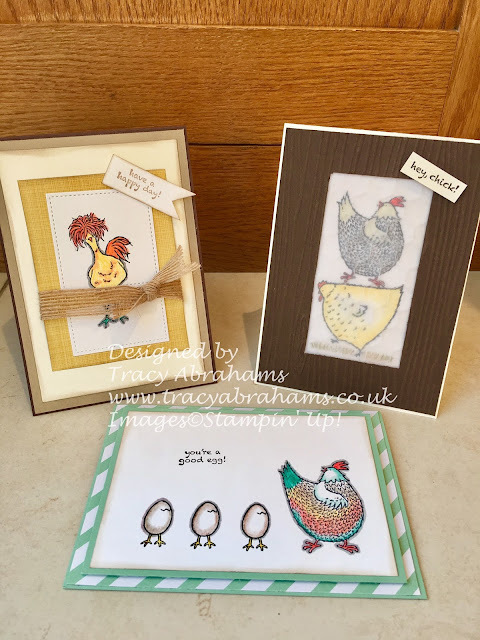 I had a great time making the cards using the stamp set and the great new Watercolour Pencils which are so lovely and easy to use. The ink colours are fresh and bright and co-ordinate with ink and card stock colours perfectly. I used a variety of the pencil colours and my blender pens to get the right effects. 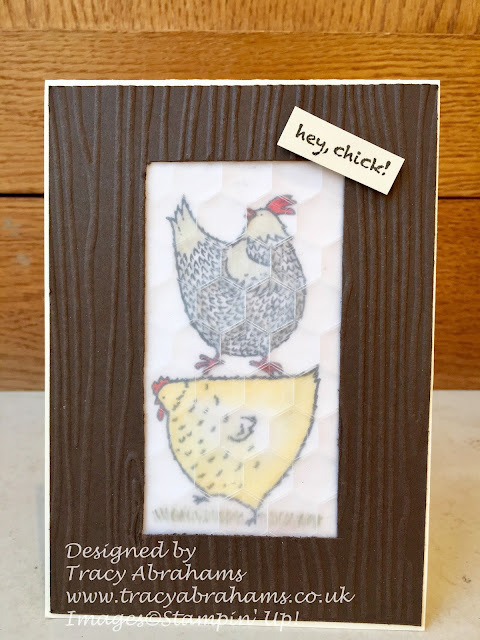 The outside of the chicken coup is made using the Woodgrain Embossing Folder and Early Espresso Card Stock and the chicken coup wire is made using the Hexagon Dynamic Texture Impressions Folder and some Vellum Cardstock. ohhhh aren't they cute !!! I just couldn't stop, colouring is so therapeutic specially after a hard day !! That's why I love my crafting you can just switch off and enjoy!!! You can click on any of the pictures above to visit my online website and take a look at the catalogues or products. If you do want to make a purchase please remember to use my hostess code DEBP2W2Q when ordering and I will send you out a Free gift and hand made thank you card. Pop the code in when it asks you " do you have a hostess code". Also during Sale-a-bration for every £45 you spend you will receive a Free gift from Stampin' Up! There are 12 Free items to choose from in the Sale-a-Bration catalogue. The catalogues showing the items are to the right in the side bar. Sale-a-bration is a great time to make a purchase with all those Free products to choose from and it's one Free item for every £45 spend, so if you spend £90 you get two !!!! and so on. 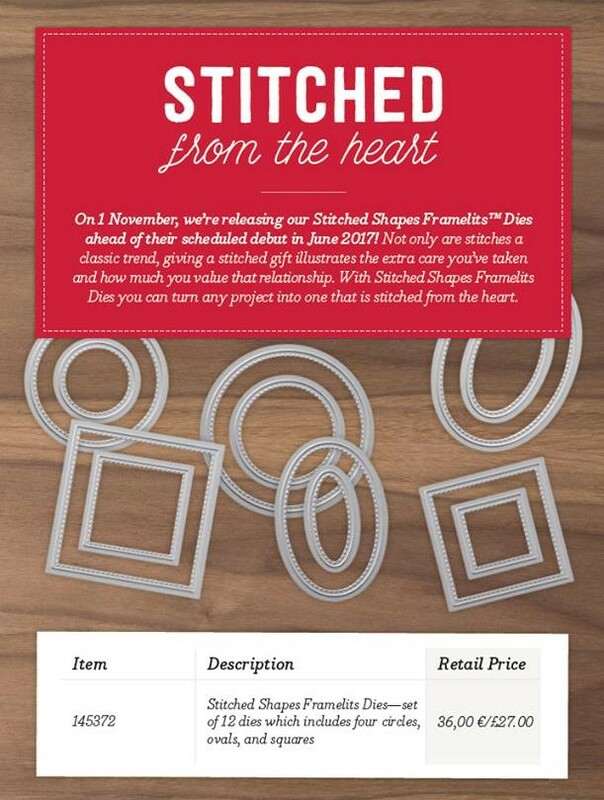 The Stitched Shapes Framelits dies are back in stock so if you love these don't delay in getting them. Once they have sold out they may not come back in for a while. I wanted to share a card with you today using a great new stamp set called Balloon Adventure from the Spring/Summer Seasonal Catalogue. It's a really cute stamp set with some great images and sentiments. I used the Balloon Bouquet Punch to cut out the balloons on the card and Melon Mambo and Blushing Bride card stock plus Melon Mambo Ink. I used the Large Numbes Framelits dies to cut out the 30 and the Stitched Shapes Framelits to cut out a great background for the sentiment. You can purchase the Stamp set in a bundle with the Balloon Pop-up Thinlits Dies at a 10% discount for £48.50 and the die gives you a great three 3d effect on any card. You can click on any of pictures above and below to go straight to online shop to take a further look. If you do want to make a purchase click on the pictures above to go to the website and please remember to use my hostess code DEBP2W2Q when ordering and I will send you out a Free gift and hand made thank you card. Pop the code in when it asks you " do you have a hostess code". Also during Sale-a-bration for every £45 you spend you will receive a Free gift from Stampin' Up! There are 12 Free items to choose from. Stampin' Up! - Stitched Shapes Framelits Dies ---- Wooohooo get yours now !! Back again to let you know the Stitched Shapes Framelits Dies are back in stock ........ I love these dies from Stampin' Up! They are so cute and versatile. I love the way you can use them to frame a stamped image or a special sentiment and that they fit one on top of each other when you want to make a frame. I love love love them !!! As you can see I loved using them on this birthday card they make any card look fab!!! You get 12 in a pack 4 circles 4 ovals and 4 squares, and they all fit inside each other and they are only £27 great value for 12 dies. You can see the video below and take a look at how fab they are. Remember if you use my hostess code DEBP2W2Q when ordering I will send you out a Free gift and hand made thank you card. Pop the code in when it asks you " do you have a hostess code". Also during Sale-a-bration for every £45 you spend you will receive a Free gift from Stampin' Up! There are 12 Free items to choose from in the Sale-a-bration Catalogue and you get to choose one for each £45 you spend. Order the dies while they are in stock so as not to be disappointed !!!! Once they have sold out they may not come back in for a while. 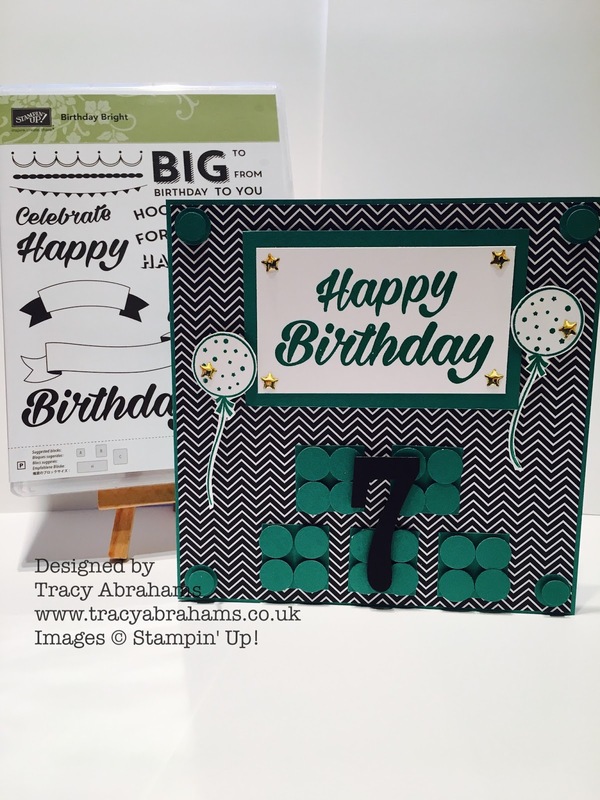 I'm really loving using the Birthday Bright Stamp set from Stampin' Up! and as it was on my messy desk lol you really don't want to see it!! I used it to make a lovely card for a special lady. She's my downline that's someone who's in my team of ladies and we all work for Stampin' Up! she joined Stampin' Up! last year during the great Sale-a-bration starter kit joining offer. She's been with Stampin' Up! a year now and i wanted to make her a special anniversary card to mark the occasion plus i put a little treat inside of some Stampin' Up! goodies. I used the lovely Falling in Love DSP ( Designer Series Paper) on top of a piece of Blushing Bride Card Stock cut at 14.9 x 21cm and scored and folded at 10.5cm. I used the Birthday Bright stamp set for the sentiment. I cut the number 1 using the Large Numbers Framelits Dies in Blushing Bride and placed it under a banner cut using the same Large Numbers Framelits Dies, and a sentiment from the Number of Years Stamp Set, and it was all done. The joining offer is super fab at this time of year as you not only get £130 worth of products for £99 but 2 Free stamp sets up to the value of £93 yay love a FREE stamp set. I have a new hostess code to pop in when your ordering on my online shop which is DEBP2W2Q which can be popped in the section that asked "do you have a hostess code" this will give me a heads up that you have ordered with me. 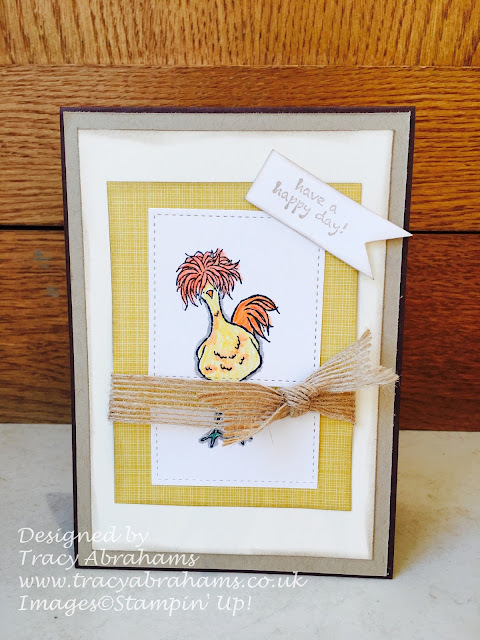 I then send a Stampin' Up! goodie as a thank you for shopping with me. I've been busying making a cute birthday card for my nephew today using the lovely Stampin' Up! Birthday Bright stamp set. It's one of the new stamp sets in the Spring/Summer Catalogue and it come with some really fun fonts for you to use on all sorts of cards. I made the card using Emerald Envy card stock and Ink which is a really lovely strong green perfect for a boys card. Plus a piece of paper from the Pop of Pink Speciality Designer Series Paper pack. My nephew likes Lego so I tried to make some using paper squares and little circles on top. I think he's going to like it, I had lots of fun doing it for him and will be popping it in the post to him later so it arrives first thing Wednesday for his birthday. 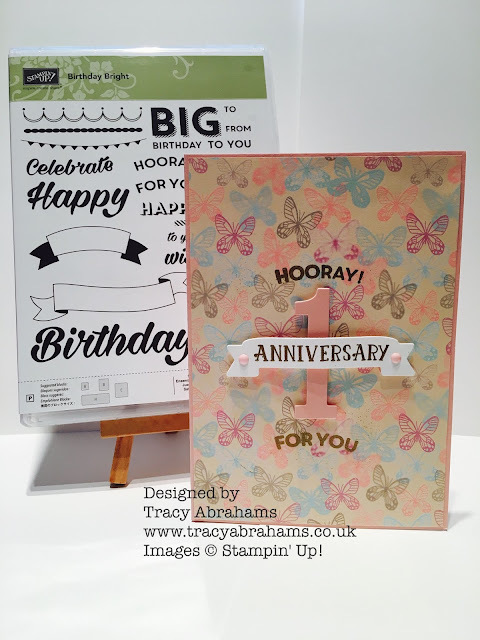 I hope you enjoyed my card today and if you would like to take a look at the stamp set pop along to my online shop by clicking on the side bar or following my link .......www.tracyabrahams.stampinup.net this link will take you straight to the page with the stamp set on it. If you do make a purchase of over £20 please use my hostess code F6QRPQQ2 and I will send you out a super gift and hand made card. I can only send this out to you if you tick the contact box otherwise I am not legally allowed to contact you. Remember that we have started Sale-a-bration now so for every £45 you spend you will get 1 FREE product and there's 12 FREE products to choose from in the Sale-a-bration catalogue. (click on the side bar to take a look ) The offer works that for every £45 spend you get 1 FREE product so if you spend £90 you get 2 FREE products and so on. How exciting !!!! YAY!!! So excited the new Spring/Summer and Sale-a-bration Stampin' Up! Catalogues are here !! There's some fabulous new products in the Spring/Summer Stampin' Up! Catalogue. (You can click just below the catalogue image to view the catalogue for yourself). I have lots of paper copies to send out so let me know if you'd like one of your own. If you have bought from me in the last year your catalogue should be with you by now if not let me know and I will send one out to you. Why join Stampin' Up! well you get to see the craft products early, you get a 20% discount on all your Stampin' Up! products you get to go to special events and enjoy crafting with my team and you get business tips and help from me!!. 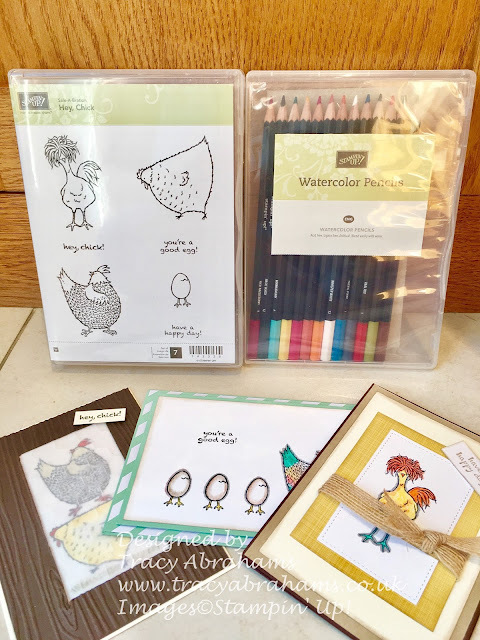 The joining offer is the best offer with £130 worth of goods for just £99 and as an added bonus during Sale-a-bration you can choose 2 FREE extra stamp sets to the value of £93. Wow what a deal. All you have to do to join my team is follow this link to my joining page https://ida.stampinup.com/en-gb/agreement and you can take a look and see what it's all about. It's such a great deal and you can enjoy the discounts and wonderful products for yourself. I'm always here to help so don't delay in looking through the catalogue and grabbing those fabulous new products and let me know if I can help.